It was a balmy Friday afternoon, but the less-than-ideal weather didn’t stop local fashion writers and editors from dropping by Dover Streeet Market on the eve of a major celebration. The multi-label boutique, founded by the legendary Rei Kawakubo just turned one. And the most talked about designers from three up-and-coming labels stocking in DSMS were in town to celebrate the boutique’s milestone. While the space surrounding 18 Dempsey Road was chaotic amidst setting the party up, fashion writers and editors in attendance were strategically whisked away to separate private spots where we each managed to spend the afternoon with Samuel Ross from A-COLD-WALL* (UK), Masayuki Ino from doublet (Japan) and Avi Gold from Better By Avi Gold (Toronto). There, we all got acquainted with their brands, their philosophies and what we can expect from them. A fine way to spend the moment, if you ask us, before mingling and champagne popping commenced the day after. Scroll down to find out more. Being nominated for the LVMH prize… I felt honoured. I honestly felt very honoured to be included in the world’s most imperative brand. It was a dream to be included in the LVMH. So when the opportunity arose and I found out I reached the finals, it really felt like a maturing step for A-COLD-WALL*. A-COLD-WALL* came about after… a three and a half year period of working with other well known designers – a whole array of brands that really capture this midpoint between street culture and high fashion. So I was working under the radar for these brands for a few years while traveling through Europe and North America. What I realized was this zeitgeist moment that was happening in fashion in Europe and North America also had a place in the United Kingdom. So A-COLD-WALL* came about after this thought process of really noting what was happening globally and wanting to ensure that the UK, London specifically, had a voice in this movement that felt very organic to London’s nuances. Those nuances being brutalist architecture, the idea of dadaism, coarse and rough and abrasive materials, old ideologies of the smog of London all while still weaving luxury into it. We also had to find a way to communicate all of these nuances of design into clothing and using A-Cold-Wall as a signifier between street culture, the underground niche culture that was going on, and also the high fashion community. The name A-COLD-WALL* is… based off of a case study that I created and it looks at London’s melting put culture. What I mean by that is you get the mix in London between working, middle, and upper-middle classes that all can live in a very small, tight facility. What happens is that when these people grow up together (which they do) and when they mix through schools, social plugs and areas, you get a cross-pollination of different ideas. So the name, A-COLD-WALL*, stems from this idea of two individuals who’ve grown up in completely different class systems; one being a working class young adult who has grown up in pebble-dash, 1950’s post WWII, council state public housing buildings… and the second being the upper-middle class child who has been brought up in surroundings that are much closer to slabs of marble and alabaster stone. It’s about when these two people meet and their environments being validated by one another. That’s where the name A-COLD-WALL* stems from. A-COLD-WALL* sets itself apart… in that it ISs uncompromised. If you look at our latest runway show, there is a sense that art lives first before the impression of having to bring in a consumer. It’s really led by art and design. As I mentioned, the architectural references that a lot of brands don’t play into, and of course the idea of talking about class systems in a very visual and experiential manner. A lot of brands aren’t willing to talk about societal issues in the way that A-COLD-WALL* does. Class systems resonate with me because… I feel like I’ve been through at least two class systems. Being born complete poor working class, having gone through education, got a first class degree, been awarded design awards and then worked with some of the greats within my generation of fashion, and of course living all across England, not just London. It’s giving me an overview and understanding of the UK that I feel a lot of people in my position don’t have or aren’t necessarily compelled in the same way to speak about. My thoughts on streetwear in fashion is that… it hass really gained momentum – it has already arrived. You can look at Demna (Gvasalia) at Balenciaga, Virgil (Abloh) with Louis Vuitton, and Gosha (Rubchinskiy) with Comme, and see that it has already arrived. What’s happened is that it has stabilized. It’s interesting because I’m new – I’m 27. And the brand is three and a half years old. I think due to the brand having a place, and an actual necessity to exist and tell a narrative, what’s happened is the brand’s growth has really been fast tracked, which is brilliant. But at the same time, my focus is on maturing A-COLD-WALL* and ensuring that it delivers the shows and messages that is capable of delivering. Then with time, potentially, I would look to go to a house if the right opportunity came along. One tip on surviving the industry is… you have to want to be good at business. It’s one thing being an artist and designer, but you need a team of people that can help you build a business. I think you can survive as an artist making clothes, but if you want to exceed and excel, you have to build a business and a team. So, my one piece of advice would be to grow your team and learn how to delegate. Sources of inspiration will be… artists like Kerry James Marshall and Damien Hirst inspire me… along with friends like Takashi Murakami and Tom Sachs. I find that often it’s fine artists or contemporary artists who inspire me. In this collection, you can expect to see… technical fabrics and custom nylons from European mills worked in a new way that I feel carries a very British energy. But in doing so it’s incredibly practical as well. I’m very excited to introduce practicality into my collection. 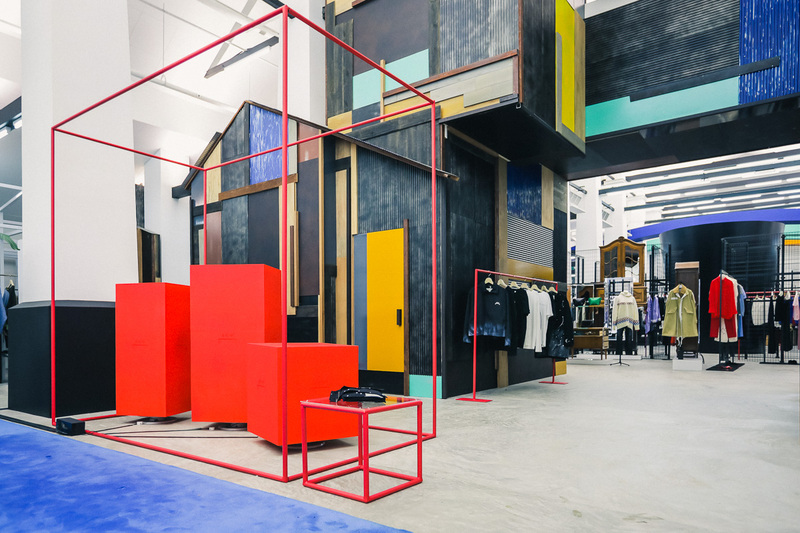 Working with an institution like Dover Street Market is… brilliant. I believe it’s come about from Dover Street Market really taking the time to watch the brand mature and understand when it’s been at the point of inception where a really organic relationship can come across. We’ve had a small dialogue over the past few years and Dover Street Market and the team have been keeping an eye on what A-COLD-WALL* has been doing and it feels very organic to now work with the brand. We’re very comfortable to do so as we feel that the product conceptually is now aligning in terms of quality, where the product is made, in terms of runway show, and in terms of global presence. So it feels like the right time to partner with Dover Street Market. Singapore is… beautiful. I’ve heard a lot of things about the eco movement here and lot of friends of mine have told me about it. But of course, coming here and seeing it for myself, it’s quite incredible to see the mixing. It’s almost like a bonding and gelling of nature, and beautiful architecture. It feels very advanced, very ahead, and very much of the future. The impression I’d like to leave is… for viewers and potential customers with an experience which stands across sound, physical installation… and of course, fashion garments. So it’s much more about digesting the entire story rather than just a purchase, you know? If I had to collaborate with anyone it would be… Damien Hirst. I think it would be an art installation. Next up for A-COLD-WALL* is… refining the brand’s collection, focusing of the team and stabilization. I also just want to make sure the clothes are as functional, as high quality and now, as luxurious as possible. doublet started when… I was a high school student wanted to be a designer. Before, I was working in Japanese fashion label for a total of nine to ten years as a designer in another company. I was looking for a chance to set up my own brand, and then it happened in 2012. I was a shoe and accessory designer in previous companies… As you know, doublet is more about ready-to-wear and maybe less accessories. I could design, but actually didn’t know how to make a pattern or anything. So I set doublet up together with a colleague. That was the story. When I design… my priority is to have a sense of humor – it’s a continuous hidden message. Also if you see this fall/winter collection, you will notice new techniques and technical stuff with a sense of humor. My sense of humour comes from… growing up in Japan up with a lot of comedy on TV. Every family there watches from 7pm to 8pm everyday. In Japan we have this culture, and comedies are an important part of our lives. To me, streetwear is… more a mix of luxury and it’s becoming it’s own category. I’ve survived the competition because… I don’t want to be an actual street-wear brand. Maybe my collection has been categorized as a street-wear brand but the focus on techniques, fabrication, uniqueness, and details sets doublet apart. One of the key products in the fall/winter 2018 collection is… the hologram with the changing the graphics. Working with Dover Street Market Singapore is like… a miracle. Also for all the Dover Street Market stores, not just Singapore, they always try to be supportive for his brand and offer every season to work with doublet on special projects and collaborations… like this container. I really enjoy working with the DSM team. Singapore is… good. I love Singapore. For example, this container project is a good example of how I was inspired by the Singapore experience. As you know, Singapore has a hot weather climate for almost the whole year. Now, for the container he features a skiing lodge which is totally different from the Singapore climate. Also, we are selling the fall/winter items now, so I want to create a snowy, cool atmosphere so that people can feel winter. The impression I want to leave behind is… to tell people in Singapore that doublet is a Japanese brand with a sense of humor. It’s a unique brand born in Japan. The future for doublet is… well, we have gotten some offers from brands, which I have to be confidential for now. But I definitely want to collaborate with Dover Street Market again! Better by Avi Gold started with… working with Sneeze Magazine – it was kind of like the starting point. But even prior to that, I had been making one off products and they really resonated well with people. It was a mix of not wanting to work for other people and always wanted to work with my friends and build a really great team. I’ve just had ideas and a lot of reference points because I’m pretty into vintage clothing and old outerwear. Being a consumer for a really long time and using really great reference points and having really talented friends who helped me along the way is kind of what built the brand. When I started making t-shirts, I wanted it to evolve and that’s kind of how this all became a brand. Our concept is inspired by… art, museums and the gift shops inside of them. I like seeing how great the products are in these gift shops and I wanted to make a better version of what I’ve seen, and that’s kind of how it came to fruition. I like buying little weird trinkets so I thought, “Why not just make my own?” I’ve bought some really great things before at the MoMA and the New Museum. Like, there was this chalkboard John Baldessari mug that you could illustrate on. Stuff like that. What sets us apart is… that no brand has ever thought about having a gift shop until we did it. We just wanted to find an interesting way to propel our products, rather than being traditional. We wanted to elevate that experience. Maybe the product will be online for a week and then you’ll never see it again.It might not necessarily have to directly relate with street culture, but it’s the whole thing that just makes Better better. That’s why if you’ve been on the website before, bettergiftshop.com, it’s essentially a shop-able Tumblr. The street-wear business is… I don’t really pay too much attention anymore. I just pay attention to what I do and how I can elevate what I do. I’m starting to not really consider what I do streetwear because it’s elevated, you know? The things that we’re working towards are being as functional as a brand like Montbell or as memorable as a gallery like The Hole or the MoMA. We’re trying to do things at that level, where it’s not streetwear. What keeps me inspired include… traveling to Japan and seeing the way they curate their stores and the experience attached to shopping there. Or even shopping at certain places, or going to flea markets. All of these things, and also vintage products help me stay inspired. I love vintage products because… they’re original. Sometimes I like 1970’s stuff, sometimes I like early 80’s, sometimes I love early 90’s. For me it’s just like, if you think about the 1980’s and how you’d get inspired to make a t-shirt back then. It’s 1000% percent original. There might be ideas, whether it’s like, “I want to make a yacht inspired collection,” but the art process and design aspect of it is really interesting and that’s what helps me push through. What makes this collection special is that… we’re going to really try cut and sew for the first real time and I’m excited to see how people perceive it. Even the graphic for the t-shirts are done with artists and are very special. They have really great staying power and you’re going to be able to wear it in five years. A lot of the inspiration behind all of the pieces that is so original is that it’s from people within the crew. Not just the local Toronto crew; the crew of Better extends to New York, to London, to Japan. Working with an institution like Dover Street Market is… great. It’s refreshing. I always say this in interviews but, they could have chosen not to work with me, but they took a risk to understand and listen to what I was doing. If you go in their space, the juxtaposition between garments and art is perfect. They reached out to me, but also my distributor in Europe is Gimme Five, and Gimme Five was a liaison. They kind of marinated the relationship. It was just very organic. Singapore is… beautiful, all the green trees and it’s so clean. I mean, Toronto is not that dirty, but this is just extra clean. Everything about it is clean. In Singapore, I hope that… people understand what we’re doing and that it resonates the same way that it does with everybody else worldwide. What’s next for me is… I have a Marc Jacobs collaboration coming out in November. Then I’m hopefully looking to work with New Balance, Nike, Arc’teryx, Clarks. Those are wishlists. Also, my friend has a brand in Tokyo called Blohm that makes loafers and I’m hopefully going to work with him on some stuff. I’m just trying to push the boundaries.